It's time for another round of The Blended Blog Asks and this month's focus is on vacation. I know I could use another vacation right about now. How about you? 1. Will you go on a summer vacation this year? Well we already went on one in June to Graeagle, but we are going back to Graeagle again in August. So I guess that means yes! 2. Do nothing but relax or pack it all in vacation? I would say a little of both. I love the relaxation, but I love going out on adventures and seeing it all. 3. 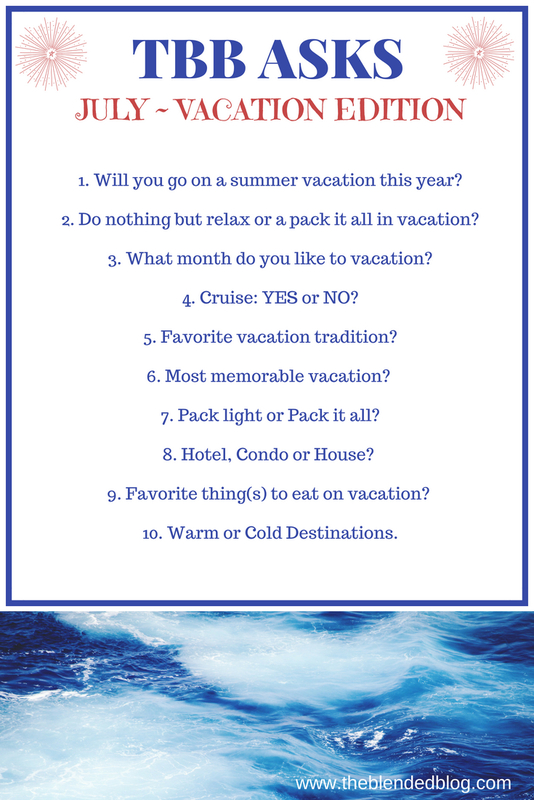 What month do you like to vacation? June. 4. Cruise: yes or no? Yes. I have only been on one, but it was a great experience. 5. Favorite vacation tradition? I am not sure I have one. Maybe indulging and getting ice cream often. 6. Most memorable vacation? Oh that is hard. All of them have been memorable, but I guess my most favorite one was Costa Rica. 7. Pack light or pack it all? I pack it all. I usually over pack, but I want to make sure I have everything I will possibly need. 8. Hotel, condo or house? All of them. I have stayed in all of them over my vacations and they all have benefits to them. 9. Favorite thing(s) to eat on vacation? Ice cream, pasta, pizza, tacos and tons of seafood. 10. Warm or cold destinations? Warm. I always over-pack! I hate that I do but I just can't help it. Ice cream is a must on vacation!! I love all the ice cream on vacation!!! We always vacation in June, too! I bet Costa Rica was incredible. It is sooo beautiful there. Expensive, but beautiful. I would recommend it to anyone! We always get ice cream on vacation, too! But then again, when do we NOT get ice cream? Haha. We love our ice cream. haha. I love ice cream. I too always get ice cream on vacation!! Who doesn't. And I'm such an over-packer it's not even funny. I try not too, but I always do. Yes!!! Ice cream is the best on vacation! I love to indulge on ice cream while traveling too! I am seeing that everyone loves this!!! Yay that you’re going again in August! And yes to all the ice cream, pizza and seafood! Yes!!! I can't wait for my next vacation! Sooooo true. 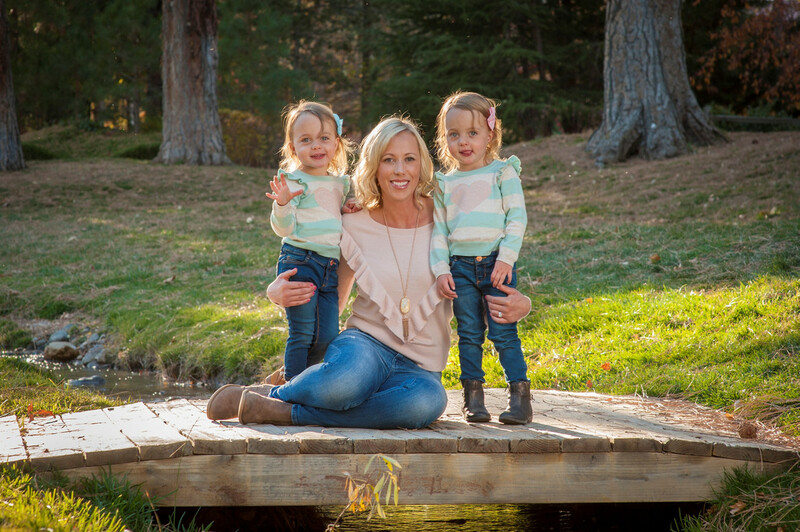 Marie from Twin Living did along with her twin sister! I hate that feeling too. I love a day to get back, relax, unpack and do some laundry and nothing else. ha. Definitely need our options!!! Especially with shoes. Our vacation foods sound very much the same, haha! Definitely warm.. we have enough cold where we live.. unless it's a ski trip of course. We have also been on only one cruise but had a not so great experience.. it was more of a straight to the ER after the vacation kinda trip. I love a good ski trip too, but I usually want the warmth! Oh no. That is awful. June is the perfect temperature month in Europe - only prob here is we get FINED if we take the kids out of school in term time, is it the same in the US? I would love to see more of your Costa Rica trip! You get fined? We do not here. They can only miss so many days before they get in trouble, but no fine. Crazy. I have a post coming on my Costa Rica trip. It was one of the best! Yay for summer vacations! I wish we could have made one work this year but the move hindered that. Well hopefully next year you can!!! I want to go on another cruise as well! i always forget something on a trip. It never fails. Ha. Ice cream was at the top of my food list too. It seems like we're always craving and stopping for ice cream on our vacation. Have a happy 4th! I always try not to over pack and it never works! I will splurge and have some ice cream this 4th as well!